The College of Charleston Opera will present a full production of Johann Strauss’ Die Fledermaus. The operetta, written in Vienna in the 1870s, will be updated to a setting of Charleston in the 1970s. Complete with 1970s attire, phrases and even a touch of its music, this production promises to be theatrically entertaining as well as musically meaningful. This production of Die Fledermaus (The Revenge of the Bat) is careful to bask in the glorious music of Strauss while taking the audience back to reminisce about a modern decade gone by. 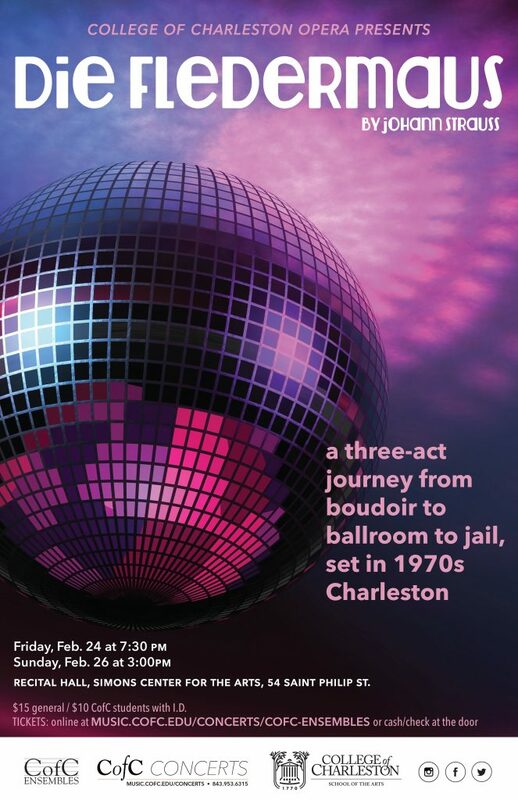 DETAILS: The performances will take place on Friday, Feb. 24 at 7:30 p.m. and Sunday, Feb. 26 at 3:00 p.m., at the Recital Hall in the Simons Center for the Arts, 54 Saint Philip St. Tickets are $15 for the general public and $10 for College of Charleston students and 18 and under, available online or at the door (cash and check only). Premiering in 1874 at the Theater an der Wien in Vienna, Austria, Die Fledermaus was Strauss’ third and most famous operetta. It is one of the most popular operettas currently in production and has been adapted numerous times for the cinema and for television. Directed by faculty members David Templeton and Amanda Castellone, the all-student cast features Bates O’Neal and McKenzie Anderson in the leading roles of Eisenstein and his wife, Rosalinda, respectively. Laura Owens and Courtney Pourciaux portray the role of Adele, the maid/aspiring actress, while Brooks Hawkins and Josh Overby play the stereotypical operatic tenor, Alfred. Jordan Scott, cast as Dr. Falke, otherwise remembered as “the bat,” manipulates the cast throughout the show as they each intend to attend the same party, unbeknownst to each other. The cast is rounded out by Madison Anderson and Catherine Rizzuto in the role of Prince Orlavsky; Stavro Najjar and Trevor Walker as Prison Warden Frank; Caleb Ballard as Mr. Blind, the stuttering lawyer; and Katherine Kuckelman and Sarah Milowic as Sally. Jon Ford plays the drunken prison guard Frosch. Music faculty member Robert Taylor will conduct a live orchestra of student musicians. The College of Charleston Opera is a program in the Department of Music at the College’s School of the Arts.